I thought about writing something separate, something special, for Ed Ford Jr., and I rethought about it, and it’s the night before the Election, and I feel that if I don’t, I’ll have left things unsaid. Most people who know me, know I can’t do that. In a sentence: Ed Ford Jr. is the future of Middletown. Ed Ford (We’ll just assume I mean Jr. at this point) is a candidate for Board of Education on the Republican ticket; One of 4, very well rounded, well-qualified candidates. But, Ed stands out among the rest because of the energy, ideas, and amazing accomplishments this young man has already achieved. At 20 years old, Ed was a student at Middletown High School just 2 years ago, but don’t let that fool you! I figured I’d go out, shake the appropriate amount of hands, take the requisite pamphlets, and get back to planning for New York. But that’s not what went down. This is when I met Ed Ford Jr., and from the handshake, I was sold. In his Senior Year at Middletown High, Ed was his Senior Class Vice President, and in the same year, became a Licensed Youth Minister. From Middletown High, he went on to attend the prestigious Johnson & Wales University, and serve as University Senator in his first year. Everything about this gentleman breathes success. He dresses well, presents even better, and when he shares his vision for our children’s education, you believe him, because everything about this young man says one thing: He’s authentic. Ed’s slogan for this campaign is: “I desire to inspire.” Ed will tell you that it’s fresh in his mind, the friends he had while growing up that didn’t believe they had what it took to be successful, and that these friends had believed so deeply in this, that it’s eventually what happened. Ed believes that our children need to not only be prepared for college, but for life, and any dreams they may have beyond school. Ed wants to challenge and engage our kids to be active in their education, and challenge themselves to explore every avenue, not only the ones that lead to better test scores. In fact, he encourages it. Ed didn’t know my background, but he knows that every student isn’t destined for college. Maybe, they want to be Firemen, or EMT’s, or work in a trade, and we should support their desires to do those things. What if we actively inspire, and engage ALL students, not just those who want to go to college? Education isn’t what it once was. My daughter went to Vinal, as I did, in her Freshman year. I wasn’t shocked to see that they were actively engaging students to attend college, but that old mantra is still there, “If you go to Vinal, you’re not going to college” We need to encourage, and engage ALL kids, in whatever field of interest they have. We need Ed’s quality of representation on our Board of Education. You’ll hear every other candidate say something about the “Achievement Gap”, but in reality, only 3 types of people have active control over the “Achievement Gap”: Students, Teachers, and Parents. Ed Ford is really the only candidate to know personally, what the Achievement Gap actually is, and has himself, overcome it. Don’t we want that kind of person representing our children’s best interest? As a Father of a Middletown High student, not only do I want that for my kid, I want it for yours. 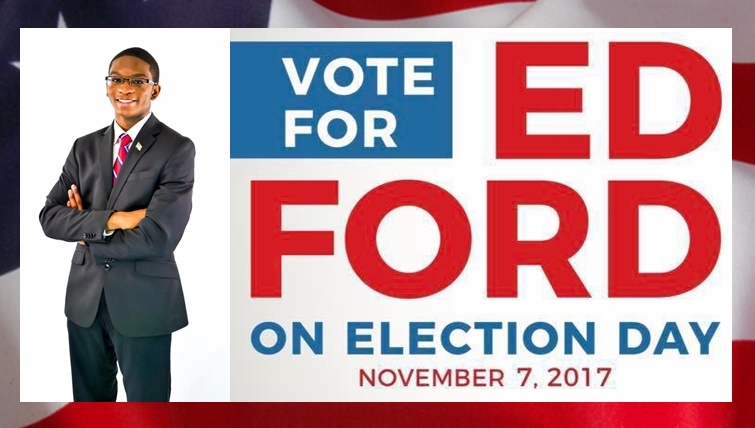 Please vote for Ed Ford Jr. for Board Of Education Today, Row B.
Author’s Note: It’s a given I endorse all Candidates on Row B. I know most of them personally, and honestly, the Board of Education Candidates are the finest panel assembled in modern history. But I truly believe I would have left something unsaid if I didn’t say what I have about Ed Ford Jr. I meant what I said, Leaders are created. They are born out of selfless service to others, and that’s what Ed has to offer. I fully predict that Ed is one of our future leaders, but he wants to serve the people, truly and dearly. He’s the real deal. The most truly authentic candidate I have ever met. I’m a better man for having met him, and we’ll all be better if we allow him to serve our great City.